We are committed to building long lasting relationships with our clients. Since Surety1 was founded in 2003, our goal has been to provide the highest level of customer service. 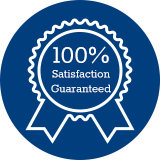 We’ve earned a BBB® A+ Rating because our existing clients have been very satisfied with our response time and our attention to detail. It has been our pleasure to get to know our clients across the entire nation. We are honored that you have placed your trust in us, and it is our goal to ensure that you continue to do business with Surety1. Feel free to drop us a line or contact us with any future requests. Our vision for the future is to continue to grow Surety1 and to refine and tailor our practices as the bond market evolves. We appreciate referrals from our valued clients, so please let us know if you have a business partner, vendor or supplier who is searching for a reputable surety bond broker.